Temporary tables are created at runtime and we can do all operation which we can do on a normal table. 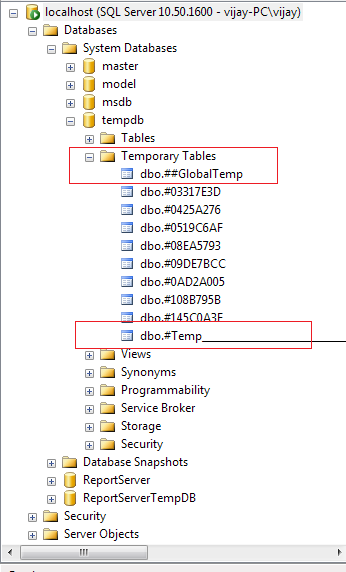 Temporary tables are stored in System Databases >> tempdb database. The local temp table is the most commonly used temp table. Local temporary table name is started with single hash ("#") sign. 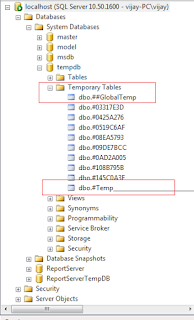 Local temp tables are only exists for the duration of user session that created the temp tables and automatically deleted when the user log off or session that created the tables has been closed. We can insert and delete the records in temporary table. Global temporary table name is started with double hash ("##") sign. Global temporary tables are temporary tables that are available to all sessions and users. These are automatically dropped when all Sql server connection have been closed.